The Slam and Spin fat burning workout is another of my easy yet highly effective set ups. This workout requires very little fitness equipment. The concept is simple, but, the research behind the method is dense and proves the effectiveness. It’s basically a twist on the powerful and effective HIIT (high intensity interval training) method. Check out the video workout demo. Below the video, I’ll go into some useful tips and tricks for the exercises and the workout. 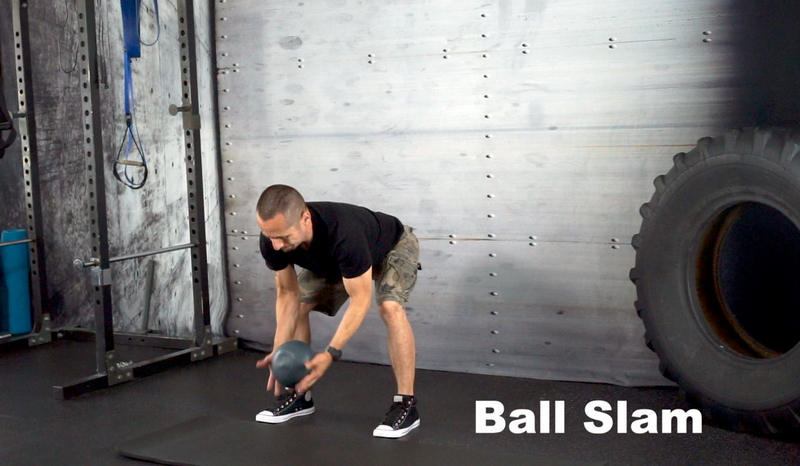 The Ball Slam (sand bag slam) is one of my favorite full body, multi-joint exercises. It’s easy to learn, and, you can either purchase a Slam Ball (or equivalent) or make one. Making one is easy. Get a sandbag, fill it to between 10-20 lbs. You can double bag it with trash bags. I’ve found electrical tape, or PVC tape works well to wrap it in and secure it. The Ball Slam is an easy exercise to learn and perform. Start in the “hinge position” as if you were going to do a Deadlift or Kettlebell swing. You then just pick it straight up and slam it down as hard as you can. The faster you go, the better the effect. Remember the formula: Power = Work/Time. The more power you produce, the bigger the tax on your metabolic processes. That high tax is what helps crank up your metabolism and assists the fat burning process. As you begin to slam the object, squeeze your abs to force them to engage and help increase power production. Your core muscles will thank you in the future. If you’ve been following Fat X 101, you already know that the Spin Crunch is one of my favorite abs exercise. It looks weird, silly and crazy, but everyone that tries it realizes how effective it is. If you’re into combat sports, especially MMA or the submission grappling arts (Jiu Jitsu, Sambo, Judo, etc.) this exercise is a must and will give you the ability to easily work from the bottom position. As you spin, try not to put your arms or feet on the floor to propel your movement. Allow the rotation function of your core muscles to do the work. As I briefly mention in the video, tracking is a huge part of the Coach Rollie Fat X 101 method. Statistical analysis isn’t just important in fitness, it’s important in your personal finances, investments, business etc. Without tracking, how do you know if you’re improving? Not tracking workouts is one of the biggest mistakes I see people making when it comes to health and fitness. Keep P=W/T in mind, and always look to increase power output on your workouts. That’s the little secret behind my fat burning method. Special thanks to Lori for helping with the exercise demo.